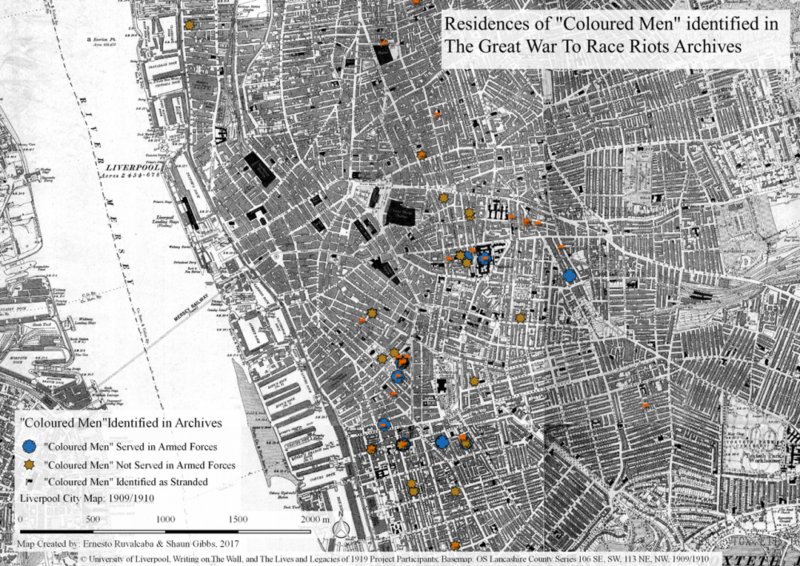 The 1919 race riots in Great Britain’s seaport areas such as Liverpool, Cardiff, and Salford were stoked by social, economic, and political anxieties and anger by white union workers and demobilised white servicemen against blacks, Arabs, Chinese, and ethnic minority communities and businesses. It was one of Britain’s most violent periods of racial upheaval in the 20th century. Since the 16th century, the black presence in Liverpool and London had been noticeable but increased dramatically following World War I at a time when the nation entered a period of economic downturn. Labour shortage and shrinking industries in port areas such as Cardiff and Liverpool were widespread. White working-class union workers and former servicemen who lacked the resources to challenge shipping magnates, largely blamed, targeted, and took out their frustrations on blacks and other ethnic minorities who they saw as foreign competitors for jobs and for the attention of white women, thus threatening Britain’s post-war national identity. The race riots took place between January and August 1919 and were sporadic throughout the year. In Glasgow from January 23 to 30, the British Seafarers Union and the National Sailors’ and Fireman’s Union (NSFU) held anti-immigrant labour meetings blaming foreigners for undercutting white British employment. At one dock in January 1919, black and white seamen, waiting to see if they would be hired, started jostling each other and soon a fight broke out and spilled into the yard. White bystanders joined in, using knives and makeshift weapons to attack black labourers. Liverpool, well known for its black population, experienced the most ‘ferocious and sustained’ rioting in June 1919. Police arrested dozens of rioters. White rioters lynched Charles Wootton, a young Afro-Caribbean. Liverpool’s rioting crowd reached up to 10,000. Out of fear from their safety, 700 ethnic minorities were temporarily removed from their homes and sought police protection. Black workers were also fired during the riots while black, Arab, and Chinese homes and businesses were damaged or set ablaze by angry white rioters. The government often did not reimburse victims for property damages. By mid-June, blacks in Salford were also attacked; their properties were also damaged or destroyed. Police intervention in the riots was also slow. However, when blacks retaliated against white rioters, the police intervened and arrested them. At the end of the riots, five people were killed, many were injured, and at least 250 were arrested. In the aftermath of the June riots, the British government, which had been monitoring black communities, intensified its repatriation scheme. The move to repatriate colonial citizens in Britain was launched in February 1919. However, after the June riots, the government began removing colonial citizens from Britain out of fear of a ‘black backlash.’ The government offered repatriates a resettlement allowance of £2 to £5, plus an additional £5 dis-embankment allowance. Between 1919 and 1921, an estimated 3,000 black and Arab seamen and their families were removed from Britain under the repatriation scheme. Shipping companies that employed Caribbeans also aided the state by firing black labourers and returning them to the West Indies. Further rioting also ensued in 1920 and 1921. Sustained racism, post-war economic hardship, and the reclassification of blacks and Arabs as ‘aliens’ with the 1920 and 1925 immigration mandates further made life difficult for blacks, Arabs, and Asians particularly in seaport areas after the 1919 riots. Panikos Panayi, ‘Anti-Immigration Violence in Nineteenth-and Twentieth-Century Britain’ in Panikos Panayi (ed. ), Racial Violence in Britain in the Nineteenth and Twentieth Centuries (London and New York: Leicester University Press, 1996); Jacqueline Jenkinson, Black 1919: Riots, Racism, and Resistance in Imperial Britain. (Liverpool: Liverpool University Press, 2009).